With all the craziness going on in the world right now, there is scant media coverage of some of the really great and beautiful news events happening right now. One of those is NASA’s Juno mission to Jupiter. The Juno spacecraft is scheduled to reach Jupiter this July 4th at 8:35 p.m. PDT (earth received time). It is currently travelling at 60,000 miles per hr. relative to earth (June 25th), and was launched on August 5, 2011. The total mission miles travelled will be 2,106 million miles, and it will enter Jupiter’s orbit at 130,000 miles per hr. The mission’s goal is to understand the origin and evolution of Jupiter. The spacecraft has a suite of instruments that will “investigate the existence of a solid planetary core, map Jupiter’s intense magnetic field, measure the amount of water and ammonia in the deep atmosphere and observe the planet’s auroras.” This mission is expected to take the highest resolution photographs of Jupiter in history. 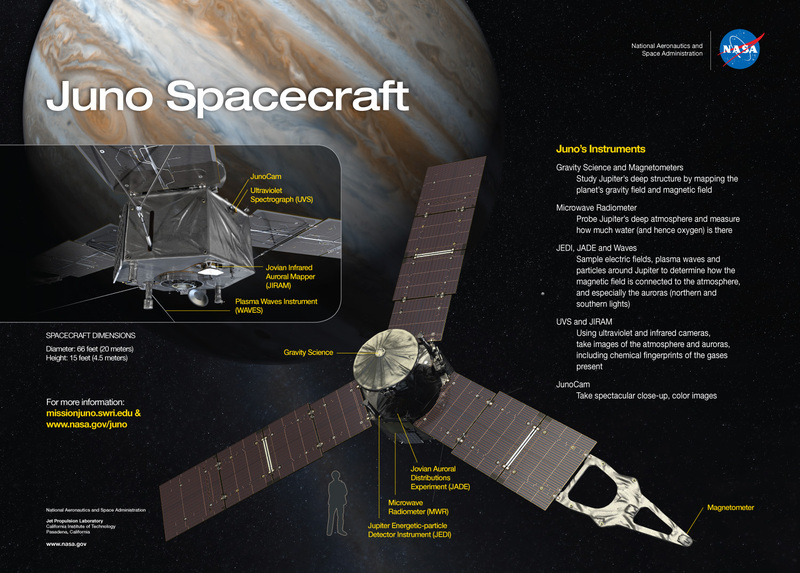 Here is a link to NASA’s Juno Mission web pages for more information.